Have you ever traveled somewhere you’ve never been, and the instant you set foot you knew in your heart that it was the perfect place for you? This is exactly what happened when Christina and I stepped off our boat taxi and onto the shores of Costa Rica’s beautiful Osa Peninsula. Near the end of our honeymoon in Costa Rica, Christina and I had debated where to spend a few unplanned days that we had in the country. We had met a couple a few days earlier who had suggested that we check out this place outside of Corcovado National Park, so we made some phone calls, took a flight and before long we were on a boat for the 1.5 hour-long ride from Sierpe to Poor Man’s Paradise. Pro-Tip: The boat road can be very rough. For those that are prone to motion sickness, be sure to take some anti-nausea medication beforehand. Also, your belongings will get wet so it is best to bring everything in a waterproof bag or at least put your back in a garbage so it is not soaked by the end of the ride. The skilled captain expertly surfed our little skiff over some rough waves towards the beach at our eco-hotel for the next two nights, Poor Man’s Paradise. The rough waters were swamping the sides of the boat and soaking our backpacks and the sea salt was stinging our eyes. We were cold and wet, but as the boat beached a few metres from shore, I grabbed our bags and humped them to the beach. I turned to help Christina with her last few steps through from the ocean before wildly spinning her around and point out to sea. A mother humpback whale and her calf took that moment to breach spectacularly out of the water, not 50 metres from where we stood. The setting was spectacular as they were silhouetted by the setting Pacific sun, creating an epic splash as they landed in the blue water and disappeared beneath the waves. 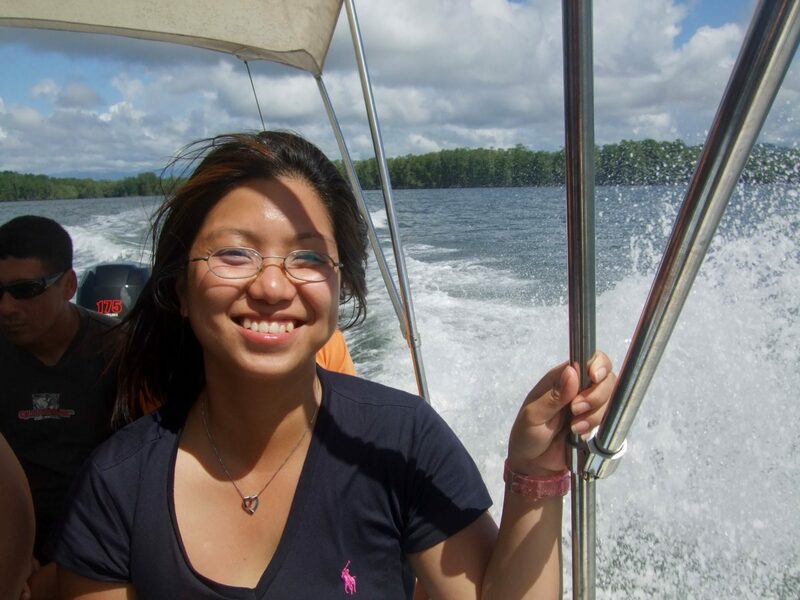 Christina and I stared into each other’s eyes, we each knew that two days would not be enough here, we had discovered paradise in the Osa Peninsula. Poor Man’s Paradise is truly an eco resort that lives up to its name. This place is not the Hilton, it’s not even a Super 8. With no more than a couple of hours of electricity provided by generators each day, and rooms stacked two high in modest layouts with lumpy beds, cracked walls, and in our case, a massive bee population that came to nest beneath our floor and had to be smoked out by the staff, luxury is not an option. It’s quaint, it’s rough, and it’s absolutely beautiful. We arrived here via the included water transport (PMP is not linked by roads or accessible via air) from Sierpe. The resort includes food, but not alcohol, and the price of the drinks here reflects the fact that literally everything needs to be shipped in. The family that runs the resort lives on-site and are incredibly friendly and open. 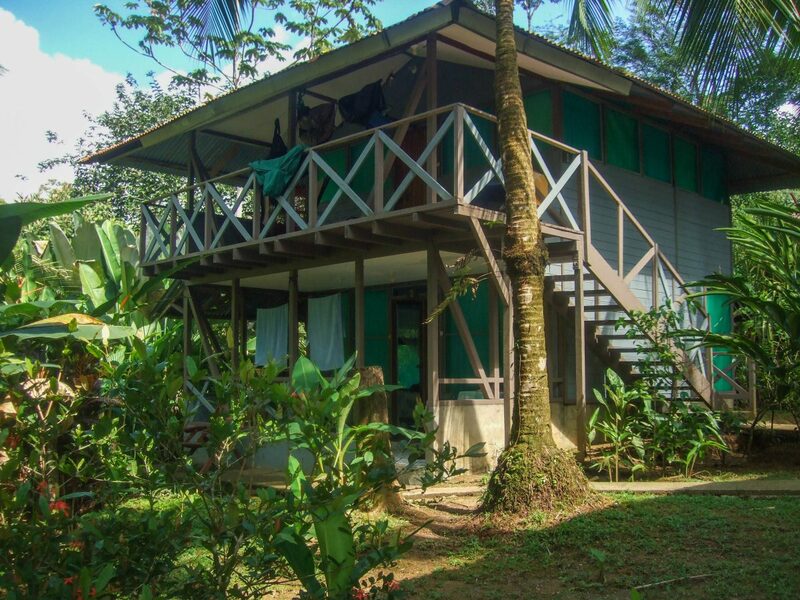 The hotel is located just on the outskirts of Corcovado National Park, and the isolation gives visitors a truly unique chance to experience the local wildlife up close. There is no wi-fi, phone service or power outside of a couple of hours in the morning and a couple of hours around dinner time. This place is perfect for solo or couple travel. On the beach during our first day, we were lucky enough to catch a glimpse of a spectacular Scarlet Macaw catching some sun. Pro-Tip: Poor Man’s Paradise has a beach, however, the water is quite rough and there are strong rip-tides, so swimming is discouraged. There is a swimmable beach a few hundred yards from the property. The first full day of our visit, we woke and hungrily downed a traditional Costa Rican breakfast of fresh fruit, beans and rice before heading to the beach to catch a boat to Corcovado National Park. Established in 1975, the park covers 424 square kilometres and is the largest park in Costa Rica. Many consider it to have the most diverse and extensive ecosystem in the country, which, if you’ve experienced Costa Rican nature, says a lot! Within the park, it is not rare to come across the endangered Baird’s Tapir, massive Harpy Eagle’s, caiman, crocodiles, ocelots, monkeys and much more. The park offers bunks for rent for those wanting to spend the night in one of the ranger stations. 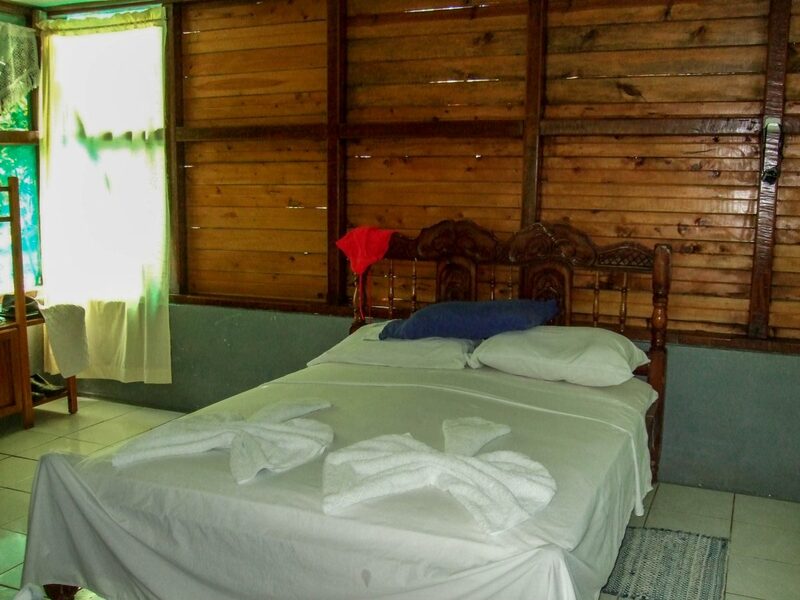 If you spend the night, you can book accommodations in Puerto Jiménez on the east coast of the peninsula. Those experiencing Corcovado at night might even be lucky enough to see jaguarundi or even the puma. Pro-Tip: Admission to the park is $15 US. As of 2014, all visitors to Corcovado National Park must be accompanied by a certified professional guide. Our trek through the forests allowed us to come across spider monkeys, white-faced capuchin monkeys and howler monkeys as well as a small group of tiny deer. The hike through the old growth was beautiful, offering views of truly wild Costa Rica. After a few beers at the Poor Man’s bar that night, we spoke to a couple that we had met in Arenal about their plans for the next day. They mentioned that they would be snorkelling off the coast of one of the nearby islands, so we spoke to the owners and after a few calls, we were signed up as well for a day out in the boats. One of the great perks of visiting such an off-the-beaten-path location is that tours almost never fill up since there aren’t enough people to fill them. We woke the next morning and after a leisurely breakfast, we met our new friends down at the beach and loaded up for a day out on the water. I’d love to say that the snorkelling was spectacular, but the water in the area gets a lot of silt and although the fish were plentiful, getting great pictures was almost impossible, especially since we needed to wear lifejackets, so diving under the waves wasn’t possible. We did have a great time on the boat, and the guides were fantastic. We all swapped stories of our journeys and were all old friends by the time we arrived on shore back at Poor Man’s Paradise. 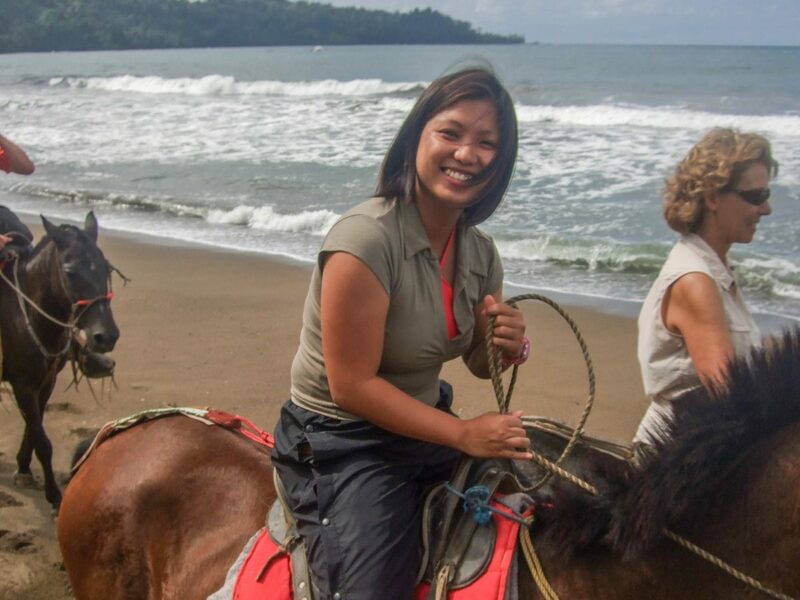 With some time on our hands, we found one of the local guides was offering some beachfront horse rides in the afternoon, so we signed up and rode down to a lovely nearby lagoon for some swimming. 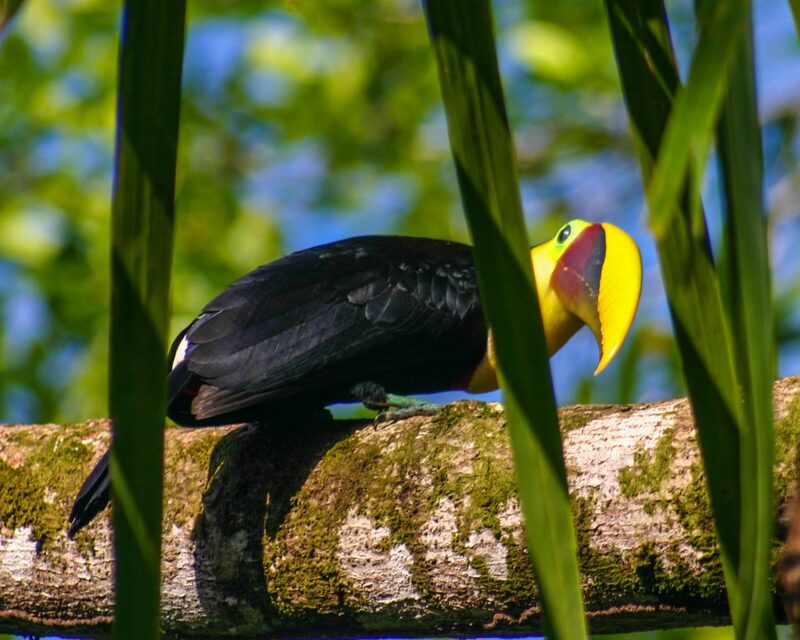 We woke up the next morning, our last full day in the Osa Peninsula, to a toucan sitting on a balcony and a white-faced capuchin monkey chewing some fruit on the trees above our balcony. I tried to enjoy the sites, but I was viciously nauseous and was having a hard time keeping last night’s dinner down. We had signed up for a dolphin and whale-watching tour for the day, and I brought our gear down to the beach, stopping once to keep my lunch down. Shortly a boat stopped on the beach with two men who let us know that they would be bringing us on the tour that day and that we would be the only two people going. We met our Captain and our guide was a marine biologist who had been living in Costa Rica for the past 8 years. We left shore and headed towards Corcovado. Before long, we had dolphins swimming off our bow, diving and playing happily. We loved seeing these magnificent animals skipping through the waves as our guide explained all about the local pods and wildlife. I held off as long as I could, but my nausea returned and I was hanging off the edge of the boat. Our guide said the best way to settle my stomach was to get in the water and let the waves and cool water soothe me, so I dove in and promptly fed the local fish. The waves certainly calmed my insides and I relaxed in the beautiful Pacific waters for a short time before Christina called to me … “Kev, I think you should get out of the water, something’s coming.” I swam over to the ladder and asked what it was as I hauled myself up. “I think it’s a shark” she said. I climbed more quickly. We watched as a single fin cut the waves as it made it’s way towards us and a massive black shadow sidled up next to our small boat. “Oh my God” shouted our tour guide, who was nearly in tears. “It’s a whale shark! In all my years in Costa Rica, I’ve never seen one before!” We were all stunned, staring at this 18 ft juvenile that decided to pay us a visit, just floating in the waves not two feet from us. It took me a minute to remember that I should be taking photos of this, so I grabbed my camera and snapped a couple of pictures from above before thinking that I should get in the water to get a good photo. I went to the edge of the boat and just as I was preparing to go over the side, the giant fish slowly sank beneath the water and out of sight. We all sat, stunned at the incredible experience and then started laughing and chatting about such a cool opportunity. As we headed back to shore, there was no doubt that the Osa Peninsula was one of the most memorable places we would visit. With all the things to do in Costa Rica, we are so happy to have ended up here. And we couldn’t wait to explore the rest of the country! Have you ever visited somewhere that absolutely blew away your expectations? Let us know in the comments below. What an incredible experience! Luck was on your side seeing that whale shark – they really are beautiful creatures and it is amazing how they glide through the water despite their giant size! As always, your photos are stunning – that toucan is so colourful and you timed it perfectly to get that dolphin photo! Wow! This truly looks like paradise. As soon as I started reading about the boat ride, I knew I would be the type of person that would need that dramamine. Was glad to see that you put that in as a tip 🙂 And how amazing is it that as soon as you got off the boat you saw whales! I have never seen whales, so that would have just made my day right there! And a whale shark? The photo of the whale shark is so interesting because I had no idea what it looked like. Ahh Italy, such a beautiful place! I can’t wait to go back and explore more than just the major cities! WOWZA. Paradise indeed! 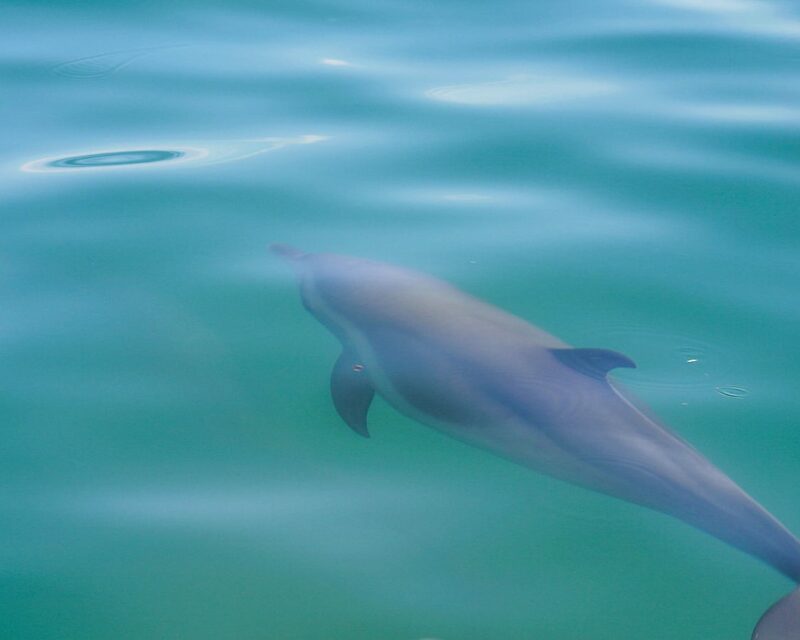 Also that photo of the dolphin – seriously impressive capture! And how lucky about the shark as well! I went to Costa Rica earlier this month but we didn’t make it to Corcovado sadly. Now that I’ve read your post, it’s clear that we missed out – and that I’ll need to return again someday :). I’ve toured through almost all of Costa Rica, and it seems like every inch is a gem! I hope you had an incredible time. Oh my, the place looks gorgeous. What amazing wildlife! What lens do you use to get such great close-ups of animals? I can’t imagine that they let you get very close. Great write-up and photos to boot. Would love to visit Costa Rica some day but it’s a bit far from London. Most of our shots were taken with an 18-55, although for some of the monkeys it was a 70-200. Some of the animals are actually quite close when you’re in the jungle, but the brush is so thick you don’t notice them until you’re almost next to them! My husband gets seasick easily too and I feel for you guys 🙁 But at least you got a close encounter with a whale shark! 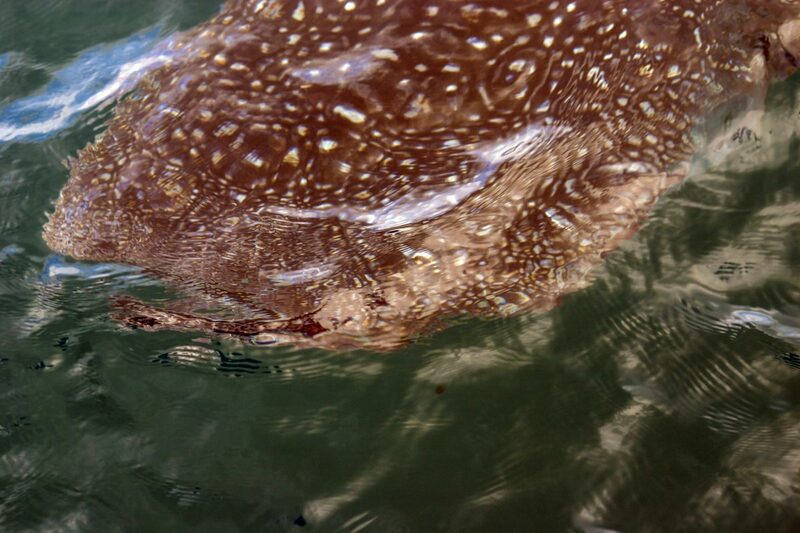 We recently swam with whale sharks in Oslob in the Philippines and they are beautiful, beautiful creatures. Thanks for sharing your honeymoon experience! You certainly had an incredible experience. It’s great that you captured as much of it as you did and were able to share it with us. Enjoyed the photos and the narrative. Nice post. I love your spontaneous spirit. I love going with suggestions while traveling through a destination and this seems like a real gem. I especially love the photos of the wildlife. We swam with whale sharks in the Philippines last week and they are very gentle creatures. I was afraid to swim with the behemoths because I thought they’re real “sharks”. Turns out they are quite the picky eaters. Great post, and makes me want to travel far away again! That must have been a very special experience. I would love an opportunity like that! Wow, it looks so beautiful there! It has always been a dream of mine to head to Costa Rica. I would love to see the wildlife! This sure is our idea of paradise too, lovely beaches and inviting waters, snorkeling, hypnotic sunsets. Cannot get any better! How wonderful that you could be spontanteous and take the advice of the couple you met! It looks like you found a real paradise that not many get to experience. Beautiful photos and descriptions, too! I really enjoy how you narrate the experience, using lots of visuals. 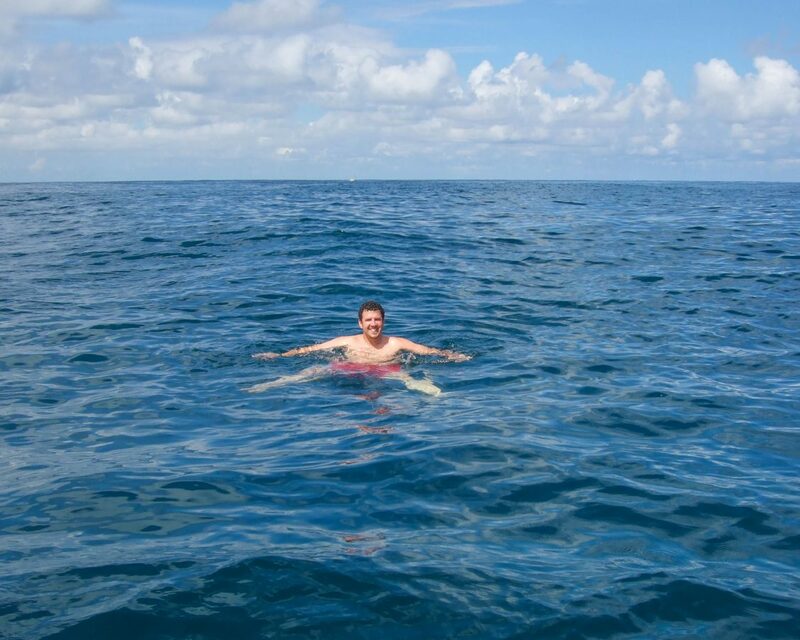 When you write about the boat, sea sickness, and having to get in the water, its very real. Awesome! Thanks so much! We do love sharing our stories. Amazing experience! So far I thought nothing compares to the Galapagos but this… wow! Thank you for sharing! And I love your travel-with-children mission. It looks fantastic and there are lots of great animals lurking around! Great write up! Thanks! I got very lucky! The whale shark is one of the most peaceful animals in the ocean, nothing to worry about, but Costa Rica has plenty of toothy ones too. In fact it has an island completely surrounded by hammerheads! Trekking into forests, snorkeling in the clear blue waters – this is MY kind of vacation. I love being close to nature so Osa does sound like a paradise to me. Thanks for sharing. Wow! It’s an amazing place! I had never heard of it. Thank you for sharing. I am a nature lover and it has everything I love. I’d love to go there! 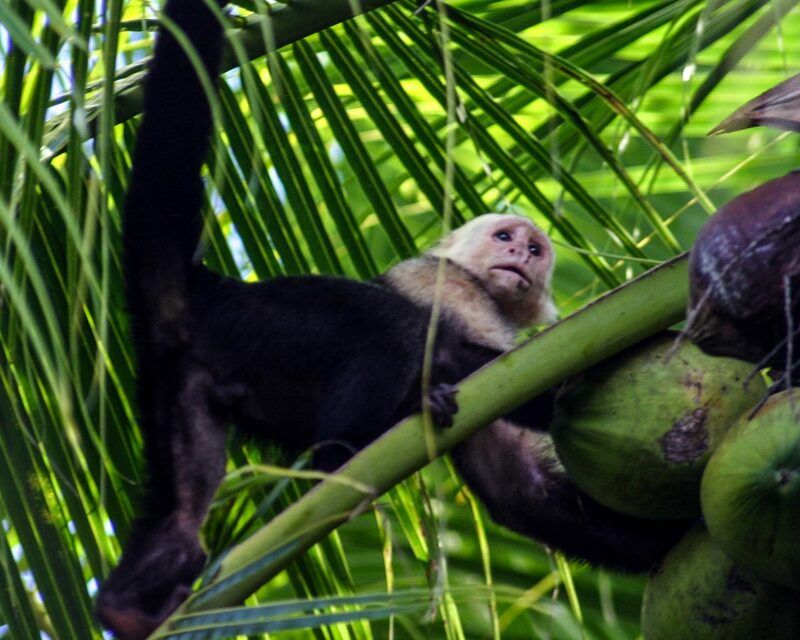 There are few places better than Costa Rica for Nature lovers. It has one of the most diverse ecosystems in the world. Absolutely beautiful! 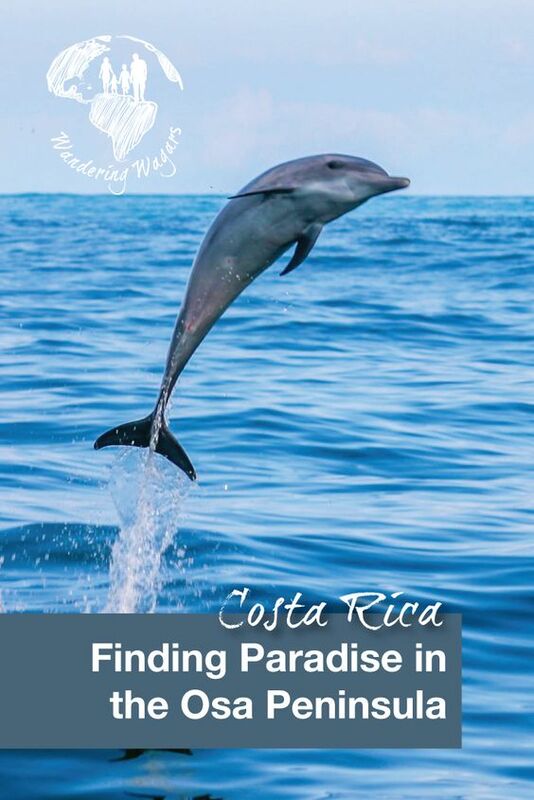 There is so much to do at Costa Rica… it looks like a real paradise! The Whale Shark is such a treat, I cant recall ever seeing one! It was a pretty incredible experience! Costa Rica is a country I could return to again and again. Dude: a sea snake. For reals. Such a cool place to visit with the kids… and now I want to book us to go! No wonder you fell in love! This place sounds amazing AND you had a few once-in-a- lifetime experiences!! A whale shark? That’s crazy. It was the perfect side trip to end your honeymoon. I’ll be adding this one to our long wishlist. i love reading this. Ilove the photos and how ypu captured the paradise and its wild life. 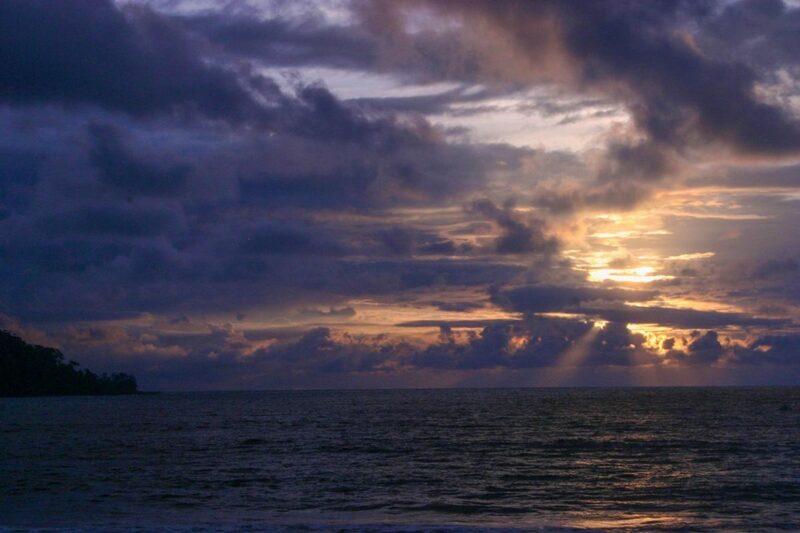 Someday, i will visit costa rica to be on this paradise. Thank you for this. What a great story! It sounds like this will be a trip that you’ll never forget! I would love to visit a resort like that. One that almost forces you to stop and get in touch with nature. And Costa Rica seems like the perfect place to do that! I can’t believe you swam with a shark 2 ft away from you!!! You seem pretty calm about it! Loved reading about your adventures together. How amazing that you discovered a place like this that instantly became so special! Thanks Erin! It was amazing, and one of the few places we’ve been where it’s possible to completely disconnect. A very liberating experience. It seems like your family sure knows where to go for something unique. I’ve been in your blog before and you guys always go to places that not many people frequent. Anyway, it looks like Osa Peninsula is a wonderful place. You’ve been to a forest and see some wildlife and then on the sea you saw dolphis and even a whaleshark. That’s so cool! Thanks Marge! We definitely try to experience as many unique places as we can, and Costa Rica was certainly near the top. I hope we can keep bringing you new and exciting places to visit! Oh my gosh, this makes me want to go even more now! So much incredible wildlife to see! How incredible that you got to witness a Whale Shark too. I am so envious right now. Looks amazing! Thank you for sharing your story! Wowww this is awesome! Would love to see a whale shark! Sounds like such an amazing experience 😀 Loved reading about your adventure in Costa Rica, can’t wait to go sometime in the future! That is such a lovely tryst with nature. Loved all your pics, especially the dolphins and that shark incident is quite scary. What a lovely place to enjoy nature! If you get seasick you have to try seasick bands! They work! You can buy them online or at a pharmacy. What I like it that they work, you don’t have to take any medicine ahead of time and you can just wear them on the boat i.e. put them one and take them off when you arrive. they work anywhere you get motion sick! Cost about $3!!! Great tip! I love that you don’t need to remember to take them an hour ahead of time. I’ll check them out. Paradise indeed! I can only wish to see so much amazing wildlife esp whales and dolphins! Amazing pictures you guys! And you definitely looked liked you had a blast. Didn’t know that that Costa Rica has something like this place. amazing! Great experiences!!! I love finding ‘un-resorts’ with enough of the basics to be moderately comfortable and be close to all that nature. Sounds like a beautiful way to see Costa Rica. Whale sharks are so serene and huge. I’ve seen a few and it’s a blessing when they chose to come close like you had. It really is! It’s been our only close encounter thus far, but we’re hoping to change that. The wildlife and birds would make it perfect for us. I’m not great with seasickness but some places are just worth it anyway aren’t they. Wow! I can only imagine how amazing it would be to see a whale shark in the wild, just floating around and totally unexpected! I think the sea-sickness conspired to get you in the water and give the whale time to find you! 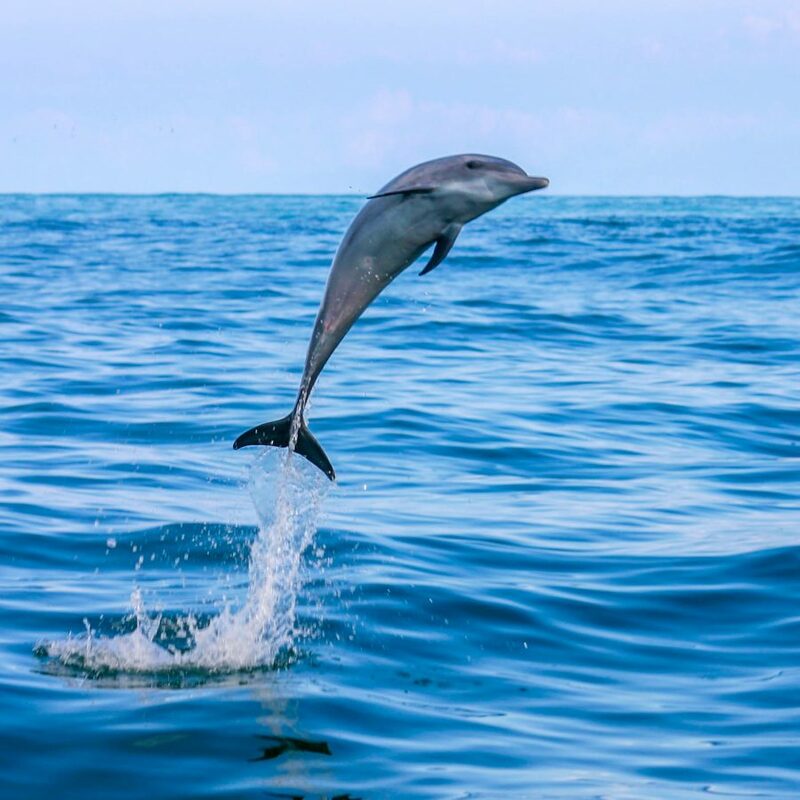 That photo of the dolphin jumping out of the water is amazing. Nice capture! And you got to see a whale shark to boot! I saw two of them in South Africa years ago, but didn’t get nearly as close as you did. I remember Osa Peninsula well. We spent 3 months in Costa Rica last summer and took a week-long trip to Osa. Missed the whales (just heard them) and loved the beaches. However, my personal favorite adventure there was driving through the mountains. Do you remember CR back roads? Well, this was the worst case, literally just a barely visible track. Luckily, our tiny Suzuki Jimny was holding very well. It was by far the wildest and the most amazing part of the country. As for getting that perfect place feeling, I have two. The first one happened on a remote beach in La Guajira province of Colombia. It was unbelievably beautiful and absolutely deserted setting with yellow sand and enormous cactuses growing next to the water. The second one was a tiny village in Sicily at the bottom of Etna: olive trees, old houses built out of volcanic rocks with a backdrop of smoking mountain if you look in one direction and a beautiful view of Mediterranean in another. What a great find! Costa Rica and Corcovado National Park are must see places for me, but now I have to add Osa Peninsula to the trip. It sounds like a beautiful getaway place. Great to know about the availability of the tours. Reading that you jumped in the water, my brain went “no, no”. I’m a chicken of what you can’t see below the water!! haha Reading ‘shark’ cured me again from the thought of jumping in. Glad you had that special sighting though. Thanks for sharing this great place!! It was amazing! I hope you get there soon and experience just how diverse Costa Rica is in person! 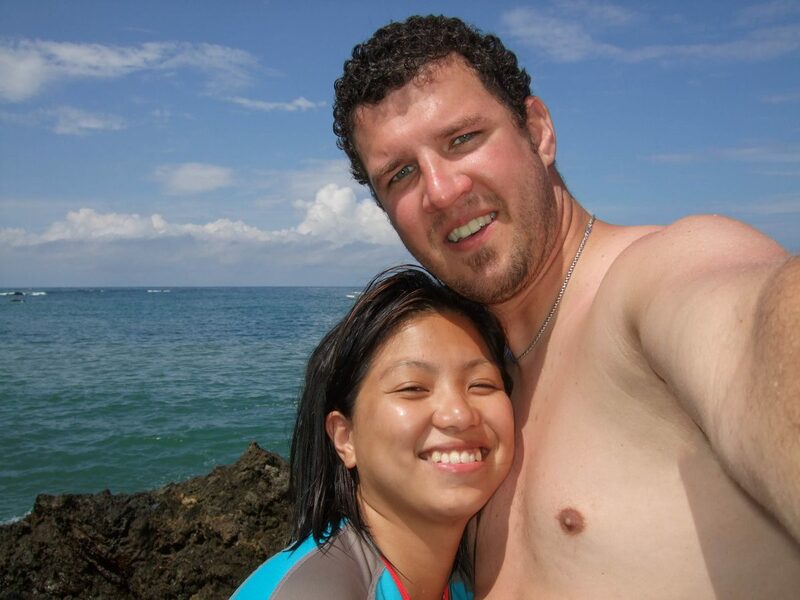 Costa Rica is definitely a fantastic place for a honeymoon, so glad you enjoyed yours! Great photos! Whoa that’s awesome that you caught a glimpse of the dolphins in the wild! I always treasure those lucky sightings! A whale shark! So jealous. I am a scuba diver and my dream is to be able to get into the water with one of these gentle giants and swim with them. Maybe one day! Ours too! Here’s hoping we both get our wish! I am sure this entire trip would have been an unforgettable one for you. Specially for the fact that you spotted the whale so closely. I must admit, I am in love with the unique destinations you write about. Cheers and Keep exploring. So happy to spread the word! What a great post, the dolphins are amazing! Beautiful pictures! And they dont even tell half the story! I cant even imagine how many memories this brought back when writing this! Great post! I love to hear about that Joe! Reliving memories are my favourite part about reading travel blogs. Wow, its a true paradise not poor man’s paradise. You are firtunate to ahve spend time here. Have bookmarked it for future ref. Splendid shots! I love all of the tropical wildlife! I’ve never been to Costa Rica, but I saw a few of those guys in Panama. Just spectacular. Enjoyed reading your article on a different site. The photos both there and on this site. Just thought I would mention that the Osa Peninsula is not in ‘Caribbean waters’… but in the Pacific Ocean. Still, of course, beautiful. What a great honeymoon! I was just in Costa Rica in May and I fell in love with it too. There’s so much natural beauty there. Glad you got to see so many animals too! I too love Costa Rica, but have not visited Osa Peninsula. We must go next time. So close to nature! A well made choice of destination. I have never got into sea like this ,nearest was during boating in Goa, India. I got to see few dolphins then. 🙂 Your encounters are incredible! Looks like you had a blast! OMG the horseback riding looks so exciting! Thank you for sharing this post with me.